Tempers have been high the past two days between Albuquerque’s Jason Sanchez, and Puerto Rico’s Jean Carlos Rivera’s camp in the lead up to their bout on Wednesday night for the vacant World Boxing Organization Youth Featherweight Title. Earlier today, the Sanchez (12-0, 6KO) and Rivera (15-0, 10KO) camps butted heads over the types gloves being used for their highly anticipated fight. 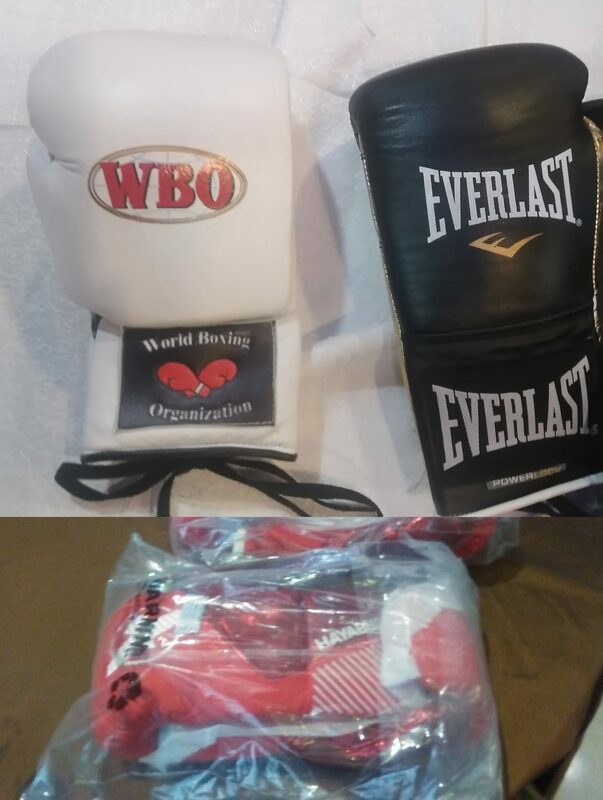 WBO gloves in white, Everlast gloves in black. Hayabusa gloves in red and white. The Sanchez camp, who expected both men to receive gloves from the Panamanian commission were surprised today when Rivera and his team brought their own brand-new 8 oz. black Everlast gloves. Sanchez and his camp were provided white WBO issued 8 oz. gloves which they felt were much more padded than Rivera’s thus leaving them at a disadvantage. According to Sanchez, Rivera’s own promoters from Top Rank and the Panamanian commission urged him to use the WBO gloves. The Sanchez camp claims that Rivera refused to abide saying that he is sponsored by Everlast and refused to use any other gloves. The Sanchez camp then says the promoters and commission suggested that Rivera sell his extra pair of Everlast gloves to Sanchez to help push the fight forward. Pepe says Rivera declined, concerned with the potential risk of his gloves tearing mid-fight and preferring to keep the extra gloves as a safe measure. This, Sanchez says, did not sit well with the commission who explained to both parties that they need to come to an agreement or find other gloves. The promoter, whom Pepe would not name, was a representative from main event fighter Francisco Fonseca’s camp. The group had members of their camp traveling from Houston, Texas on Wednesday afternoon and were happy to lend a hand and bring with them a pair of red and white Hayabusa boxing gloves with the permitted laces. The Hayabusa gloves were approved by both the Panamanian commission and Rivera’s camp which clears the way for tonight’s match. Although an official way to watch the Sanchez vs Rivera fight has not been announced, the following channels and links are potential ways places to watch. They are listed in order of reliability. Sanchez and Rivera are expected to take the ring between 8:30pmMT and 9:30pmMT. If your web browser does not load, use your browser on your XBOX, or Smart TV. Note: It is very likely TyC Sports, an Argentine sports channel, will cut their feed of the event after Argentine prospect Agustin Mauro Gauto fights.